A Facebook acquaintance – a Zionist – asked me some questions recently. I’ve heard these questions before, and I have strong feelings about the answers, so I thought I’d share them a little more widely than with just the one person. I’m also including links for reference, because I don’t make things up (however I have no citation for the statement “I don’t make things up”). He asked where they record the list of deaths/injuries among Palestinians that occur at their own hands? Or do they get lumped in with those blamed on Israel? Common sense dictates that these injuries happen dozens of times daily during the chaos of these riots. When you watch the Great March, do you actually see a non-violent protest? Because that is not what we (pro-Israel Jews) see. And when we hear thousands of people chanting “from the river to the sea,” it’s hard to believe that nobody wants to go into Israel and take over. Do they honestly feel that all of the protestors are non-violent peace loving people who have no desire to destroy Israel? What is the end goal of the rockets, fire kites, etc? Friday protests aren’t 20,000 people with slingshots, but mostly spectators, with demonstrators milling (not packed) near the border. Seems to me that demonstrators are more likely to be injured by those tear gas cans raining down (not to mention the sniper bullets). I won’t be asking my Gazan relatives who’s counting the self-inflicted dead – I think it would be insulting to ask them (though I don’t mind you asking me). I hope you’ll pass along my sincere answer to your son: “it’s not important.” To focus on the odd, accidental Gazan-on-Gazan injury is to (inadvertently or purposely) miss the point. 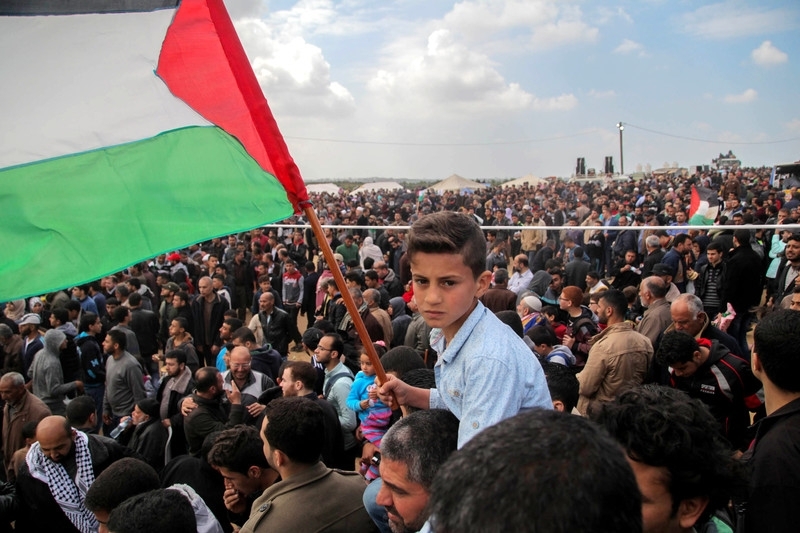 What is important – and I wonder sometimes how many Israelis and supporters of Israel truly understand this – is that Gazans are protesting for their basic human rights, for the ending of the blockade, and for their right of return. I hope you will tell your son that Israel is being heavy-handed to say the least. No human being, let alone 2 million human beings, deserves to be treated the way Gazans are being treated. And if you believe Hamas is a terror org that rains down rockets, fine, but 2 million Gazans aren’t raining down rockets and don’t deserve to be starved and bombed. The United Nations declared 70 years ago that Palestinians should be allowed to return to their homes. Do discuss that with your son. It’s part of the answer. Just one Israeli soldier has been killed since the start of the Great March (one too many). His killer was a Gazan sniper. Over 170 Palestinians have been killed by snipers – on their own side of the border – medics and journalists, protesters with their hands up, people helping the injured, folks standing around, or praying – their killers were Israeli snipers. Somehow, the Gazan shooter was a terrorist (though his target was military), and the gentlemen who shot unarmed demonstrators were not. Somehow, collectively, those Palestinians had it coming to them. We’ve been told that “they” want to overrun Israel and massacre all of the Jews. the good people are the ones killing everyone. Israeli soldiers are seen next to the border fence on the Israeli side of the border with the northern Gaza Strip, Israel, March 30, 2018. Of course, there is the overt, ongoing violation of West Bank and East Jerusalem borders in the form of 600,000 settlers, not to mention the raids of Palestinian villages and even homes. Is the Great March peaceful? Excuse me? After 50 years of occupation/oppression and 11 years of blockade, do you expect them to march quietly in a straight line? Do the noise and smoke make you uncomfortable? You don’t actually think those ragamuffins are going to invade Israel and kill millions of Jews, do you? They are chanting “from the river to the sea,” but so what? (By the way, isn’t Eretz Israel – Greater Israel – “from the river to the sea” too?) Palestinians are literally powerless. They have no allies, practically no weapons, they’re starving and half of their men are either dead or in prison. Israeli snipers and tanks and drones are watching their every move. Top-of-the-line Israeli warplanes are ready to drop half-ton bombs on their already-crumbling houses. They can’t get out of Gaza, let alone take over a square foot of Israel. Let’s be real here. You have nothing to be afraid of from Gazans. NOTHING. So at least let’s stop the charade of fear. The end goal of those terrible fire kites and rockets, you ask? To go down fighting. Gazans know they don’t stand a chance. They know. They know Israel holds all the cards and has the most powerful ally in the world – the one with all the money. Do Palestinians want to destroy Israel? There is resentment in many hearts – who can blame them for that? – against Israel and against the US. There is anger. There is frustration. But “hatred”? “Destruction”? Most Palestinians are too busy trying to make ends meet. Israelis, sorry, but Palestinians don’t sit around dreaming about destroying you. If they have time to dream, they dream of a normal life in a just world. As for the “rockets raining down,” they are hyped by media and by Nikki Haley. The last time an Israeli was killed by a rocket, other than wartime, was October, 2011. Rockets are another mostly symbolic part of the Palestinian refusal to go down without a fight. So yeah, Gazans’ end game is just to not die with their hands in their pockets. They have no delusions of grandeur. If you’ve never been in such a struggle, in which you knew the final outcome was death – yours or perhaps the next generation’s – you can’t know the mindset in which desperation and dignity come together. They say, “We will not be defeated,” but they know they are already defeated. They chant, “from the river to the sea,” but they know they’ll never get past the rubble on which they stand. They shout, “give me liberty or give me death,” knowing which one they’ll end up with – and it ain’t liberty. 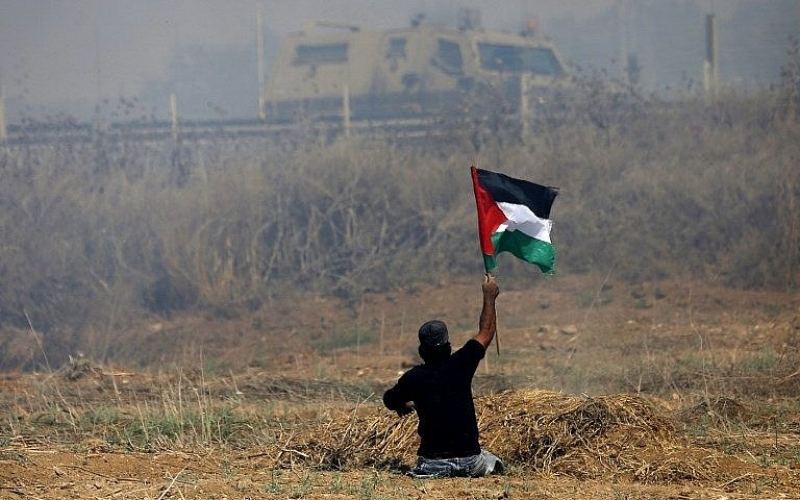 Palestinian demonstrator Ibrahim Abu Thurayeh, who lost his legs in a 2008 Israeli airstrike, waves a Palestinian flag during clashes with Israeli soldiers near the border fence east of Gaza City, May 19, 2017. (AFP Photo/Mohammed Abed/File) Abu Thurayeh was killed by an Israeli soldier December 15, 2017.